Here's a promise: I will wear these boots until they break. They are my favorite boots. Ever. Your dress is such a beauty! <3 Dear Creatures always has the most wonderful designs! i don't think it's possible for you to post and for me not to drool over your hair! it's awesome!! You look lovely. Question for you actually - do you dye your hair? If so, what's your natural colour and which dye (if boxed) do you use? I've been a 'redhead' for almost a decade, but I haven't ever gotten your shade to work. Thanks in advance, and have a great Thursday! i concur on the coffee comment. and those are lovely boots! I think this may be my favorite outfit post yet! Love everything about it. Great belt and boots: they are true friends forever and they perfectly go with the purple socks! Bye! So pretty! Love the socks! I absolutely love your hair! It's such a pretty color. I also LOVE that outfit! Adorable! Your hair is my favorite thing ever. Those boots are in fact amazing!! sooo pretty! 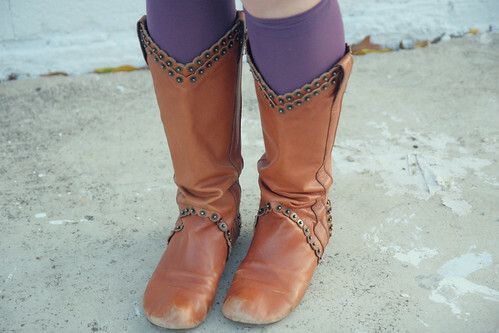 those boots are awesome, i love the color paired with purple! That cardigan looks great with that dress! And I understand about the boots, mam. You look beautiful!! And you should curl your hair more often, it suits you so well. I love this outfit. The cardigan is super fun, and those boots! They're darling! Such a cute dress! Also love the boots. super cute boots! I have items like that too that i just can't part with until they aren't useable anymore. ohhhh i love those boots as well! definitely keepers! I love the whole look! I wish I could curl my hair to look like that. I'm terrible at it. wow, no kidding, i would too! those boots are amazzzzzzing. you're always adorable! i love your hairstyle . . . is there something specific you asked for when you originally got the cut? I've tried to ask for something similar before and never successfully got it. wow! very nice shoes and very cute party dresses. Thanks for sharing us. And everything written above is true! that dress looks wonderful on you!!! I love this whole ensemble. You have got great style! I've just found your blog and I'm CRAZY about it! I love your style, your hair, and your blog. Promise I'm not a stalker :) I'm following now and can't wait to read more. Stop by my blog some time and say hi (and follow back if you're interested). I love that dress! Grey is up there as one of my favourite colours (some people think it's dull - I wholeheartedly disagree). funny! i did a double take on this post because of that sweater. i looked closely and came to the conclusion that yes, i definitely used to own that... and then your credit to it being an UO sweater from years ago? yep! i totally had that! sadly i gave it away to a friend because orange was not my color at the time. i'm still sad about it :( .... looks cute here! !